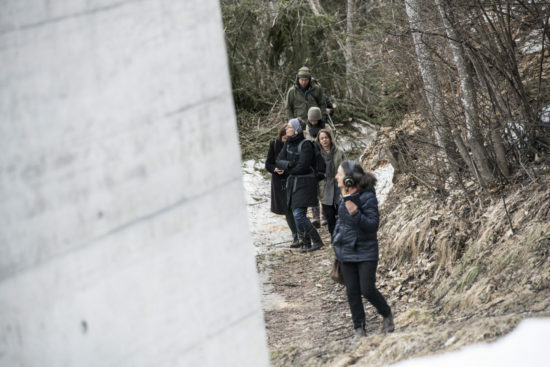 For the audio walk Shinonome東雲 Tomoko Hojo and Rahel Kraft explored the acoustics of dawn in relationship to walking and light during their residency at ZKM – Center for Art and Media Karlsruhe Germany. Due to reduced visual inputs our auditory sensibility is and we perceive sounds which are normally overheard. Dawn is a transition between night and day, dreaming and being awake, light and dark, and loudness, natural and supernatural, a daily phenomenon which is rarely connected to the sonic but rather to the visual impact during the blue. The exchange of recorded dawn-diaries, as well as Japanese, Chinese, English and German literature related the theme, made a starting point for shared perceptions and memories. In search for a site with various transitions, Hojo+Kraft chose the Schlossgarten in Karlsruhe as a place between, animals/humans, /silence, center/periphery. Several sonic interventions and listening walks in response to the structure and atmosphere of the Schlossgarten were conducted. Field and voice recordings melted into a collection of audible traces and boundaries, the trembling feeling towards unidentified sounds and the perception of time during twilight. In the compositional process Hojo+Kraft travelled to northern Norway to experience an extended dawn during the polar lights. The observation of the inspiring light transitions intertwine with fictional entities, the mythology of Aura and miniature text fragments of Ezra Pound, Banana Yoshimoto, Emily Dickinson, E.E. Cummings, Chü-, Carlo Rovelli and Hilde Domin to create a dreamlike, state. Twelve compositions with a total length of 50 minutes are leading listeners through time, traces, tremor and transformation to open alternative perspectives to the Schlossgarten. Shinonome expands our auditory sensibility which often has been forgotten in noisy city life. Shinonome is an audio walk composed for and with the smartphone app MyCityMySounds developed by the institute of music and acoustics at ZKM – Center for Art and Media Karlsruhe Germany. My CityMySounds is an interactive interface to – various audio formats, to create a virtual city space through sound. Prior to this work Hojo+Kraft have developed their own – audio walk app INNERN in collaboration with musician/programmer Urban Lienert in 2018.